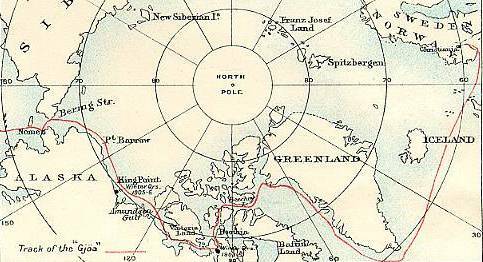 The search for the Northwest Passage took a new start in the 19th-century. The British Admiralty had promised a £ 20 000 prize, in 1743, to the first ship able to sail through the passage. In 1819-20, the Edward Parry expedition brought the issue closer to a solution. Members of the expedition entered the Lancaster Sound, continued westward through the Barrow Strait and the Melville Sound, and thus discovered most of the Northwest Passage. John Ross (1777-1856), a British naval officer, made an attempt to sail through the Northwest Passage in 1818-19. He was sent by the British government. The expedition failed to reach its objective, but important scientific findings were discovered instead. From 1829-33, Ross became the first person to use a steamship on an arctic expedition. He discovered the Boothia Peninsula and was able to determine the position of the magnetic north pole. Sir John Franklin (1786-1847), another British naval officer, undertook several journeys to North America during the years 1819-27. Various scientific experiments were conducted along the arctic coastline. In 1845 he was appointed leader of an Admiralty expedition which intended to take on the Northwest Passage once more. They came into contact with a whaling ship in Baffin Bay but were never heard of again. We have come to know in time since that the ships had become icebound to the northwest of King William Island, and that Franklin died there in 1847. The surviving crew left the ship in 1848, trying to find inhabitated areas, but they all perished. Several rescue expeditions were organized, as a result of their disappearance, but all to no avail. In 1850, Robert McClure sailed through the Bering Strait, tackling the Northwest Passage from the western side. Sailing eastward, he and his party became trapped by ice to the north of Banks Island. They were rescued by another expedition in the summer of 1853 and taken eastward before finally reaching home. Because of this, McClure was the first individual to sail through the Northwest Passage, even though not having sailed on his own vessel the entire distance. He was awarded £ 10 000 in prize money - or half of the originally promised £ 20 000. The Norwegian Roald Amundsen was the first person to sail all the way through the Northwest Passage on his own ship. During the years 1903-06, he sailed from east to west on his vessel, Gjøa. He stayed for two years in Gjoa Haven on the southern shores of King William Island, where he carried out terrestial magnetic investigations. Gjøa wintered for the third time near the outlet of the Mackenzie River before finally sailing into the Bering Strait in 1906.